Your chances of getting hired drop dramatically if you do this during a job interview; what is it? Your chances of getting hired drop dramatically if you bring a gift to the person or persons interviewing you! Congratulations to Rachae Cornett of Dublin, IN for being the first to answer the Impossible Question! About 10% of all adults admit that they are afraid of this, even though most kids love it; what is it? Even though kids love them, about 10% of all adults admit that they are afraid of balloons (more specifically popping a balloon). Congratulations to Kim Vaughn of Centerville for being the first to answer the Impossible Question! Nearly a quarter of all men are jealous of a friend or co-worker that has this; what is it? Nearly a quarter of all men are jealous of a friend or co-worker that has a full head of hair! Congratulations to Judy Retz of Winchester, IN for being the first to answer the Impossible Question! The average person will wait a little over a month before they do this in front of someone new that they are dating; what is it? It’s something typically done in a public setting - department store, restaurant, etc. The average person will wait a little over a month before they use a coupon in front of someone new that they are dating! Congratulations to James Martin of Economy, IN for being the first to answer the Impossible Question! A little less than half of all people agree that this will instantly make someone more attractive; what is it? A little less than half of all people agree that sunglasses will instantly make someone more attractive. Congratulations to Brent Schuyler of New Castle, IN for being the first to answer the Impossible Question! A little over half of all women admit that they do not trust their man to do this correctly; what is it? A little over half of all women admit that they do not trust their man to repair their car correctly! Congratulations to Michelle Mathena of Richmond for being the first to answer the Impossible Question! Nearly half of all people that live together disagree on how to do this; what is it? Nearly half of all people that live together disagree on how to load the dishwasher! Congratulations to Brian Schuyler of Knightstown, IN for being the first to answer the Impossible Question! Nearly half of all women agree that a man should never wear this to work; what is it? Nearly half of all women agree that a man should never wear short shorts to work! Congratulations to Caitlin Crosby of Richmond for being the first to answer the Impossible Question! Women are two times more likely than men to daydream about this; what is it? Women are two times more likely than men to daydream about quitting their job! You are more likely to fake this at work than anywhere else; what is it? You are more likely to fake a conversation on a phone in order to avoid speaking with someone at work than any other place! Congratulations to Savannah Rowles of Richmond for being the first to answer the Impossible Question! About 10% of all women have ended a date early because of this; what is it? About 10% of all women have ended a date early because of how often he used foul or offensive language! Congratulations to Dustin Davis of New Castle, IN for being the first to answer the Impossible Question! 65% of all people say they never wash this unless it gets really, really dirty; what is it? 65% of all people say they’ve never washed their cat!!! Congratulations to of Levi Simmons of Richmond for being the first to answer the Impossible Question! 20% of all men have done this in front of people to look more masculine; what is it? 20% of all men have ordered their steak rare in front of people to look more masculine! Congratulations to Ashley Ruble of Connersville, IN for being the first to answer the Impossible Question! Nearly 20% of all parents say this is the #1 thing that they argue about with their kids; what is it? Nearly 20% of all parents say that brushing their teeth is the #1 thing that they argue about with their kids! 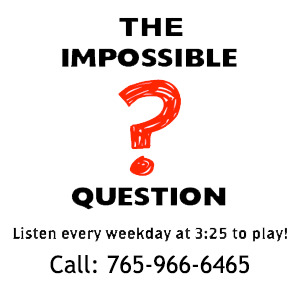 Congratulations to Tamara Tomlin of Connersville, IN for being the first to answer the Impossible Question! Nearly half of all men agree that they will feel more inclined to kiss a woman on a first date if she does this on their date; what is it? Nearly half of all men agree that they will feel more inclined to kiss a woman on a first date if she wears red lipstick on their date! Congratulations to Pauline McDaniel of Richmond for being the first to answer the Impossible Question! 39% of all people admit to doing this when having friends or family over to the house; what is it? 39% of all people admit to always lighting a candle just before friends or family arrives at their home! Congratulations to Jack Duncan of New Castle, IN for being the first to answer the Impossible Question! They did a study of the things we miss most from our childhood...getting to stay home for school holidays was number one followed by, hot summers, playing outside until the streetlights came on and not having to work. What was the fifth thing we miss most from our childhood? Most kids would never think this possible...until they get older and think otherwise. They did a study of the things we miss most from our childhood...getting to stay home for school holidays was number one followed by, hot summers, playing outside until the streetlights came on and not having to work. The fifth thing we miss most from our childhood was spending time with our parents. Congratulations to Corey Brannon of Richmond for being the first to answer the Impossible Question! Women are four times more likely than men to lose their cell phone here; where is it? Women are four times more likely than men to lose their cell phone in a public changing room! Congratulations to Aaron Garringer of Richmond, IN for being the first to answer the Impossible Question! 54% of all parents would be shocked to know their kid has done this; what is it? 54% of all parents would be shocked to know that their underage teen has already driven their car without permission! Congratulations to Mike Gibson of Indianapolis, IN for being the first to answer the Impossible Question! 51% of all people say that this is one of their biggest office pet-peeves and it involves more than one if not many of your co-workers or associates; what is it? 51% of all people say that someone that uses the “Reply All” function in an email that only needed to go to one person is one of their biggest office pet-peeves! Congratulations to Heather Sittloh of Richmond, IN for being the first to answer the Impossible Question! Nearly a quarter of all men admit to doing this once a week in the spring and summer and only once a month in the fall and winter; what is it? Nearly 25% of all men admit that they will wash their car once a week in the spring and summer and only about once a month in the fall and winter! Congratulations to Kirsten Gray of Lewisburg, OH for being the first to answer the Impossible Question!